These three dividend companies are betting on students; should you bet on them? Imagine a simple way to invest and benefit from the millions of students who flock to college every year. Luckily for you, that dream is a reality. 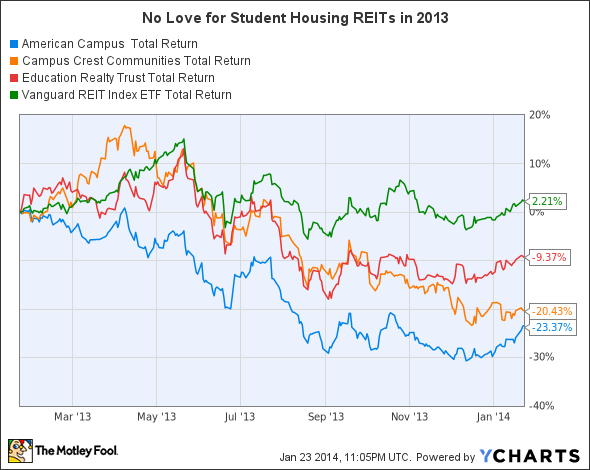 There are currently three publicly traded REITs that focus specifically on student housing: American Campus Communities (NYSE:ACC), Campus Crest Communities (UNKNOWN:CCG.DL), and EdR (NYSE:EDR). Mr. Market thrashed all three of these companies during 2013. Could this be an opportunity for value investors in 2014? The REIT sector as a whole took it on the chin last year, but that still doesn't explain why the niche student housing sector underperformed vs. the Vanguard REIT Index ETF (NYSEMKT:VNQ). First and foremost, the long-term growth trend in college enrollment appears to have been slowed by demographic and economic factors. This leads to concerns about sector overbuilding and far fewer opportunities in the future. Increased competition for fewer opportunities could result in slimmer margins moving forward. According to student lender Sallie Mae (NASDAQ:SLM), nearly two-thirds of students chose to live at home or with relatives as a cost-saving measure in the 2012-2013 academic year. And perhaps even more troubling is that 47% of students whose families earn more than $100,000 are living at home while attending college, compared with 37% in 2011, and 24% in 2010. These national trends don't appear to bode well for companies solely focused on for-profit student housing located on or adjacent to four-year colleges. All real estate markets are local in nature. The key for these companies is to figure out how to construct, own, and operate student housing where demand exceeds supply. Even more ideally, there would be locations with high barriers to entry that limit future competition. A lack of affordable land or potential redevelopment sites, combined with high hurdles for zoning and entitlements, can all contribute to long-term profitability for a student housing project. Also, partnering with colleges to build facilities on campus can give private developers a significant edge over off-campus student housing and traditional apartments. Rendering of EdR's building at UK. A current example of this is the University of Kentucky public/private partnership with EdR. EdR is financing approximately $100 million of projects utilizing its On-Campus Equity Plan, or ONE PlanSM -- which uses the company's equity and financial stability to fund projects on university-owned land. Construction is under way on 4,000 beds of student housing and related facilities as part of UK's Board of Trustees' efforts to revitalize the campus core. The five buildings are planned to be completed during 2014 and 2015. American Campus has a similar program, American Campus Equity, or ACE. They've used it to implement major projects at five different universities. One example is a partnership with Arizona State University on five projects between 2008 and 2013 with a combined development cost of over $350 million. These projects included: 5,000 beds, mixed-use retail, food service, and faculty space. Campus Crest is the new kid on the block with a $590 million market cap. Since its IPO in October 2010, Campus Crest has grown to operate 78 properties totaling 42,000 beds. Eight of these properties are currently under development. Campus Crest tends to focus on smaller colleges where its Grove student housing concept can be constructed in a cookie-cutter fashion. Being able to duplicate the same design results in cost savings. Campus Crest has recently branched out with a larger Copper Beech townhome product, and an evo brand luxury concept for high-density urban locations. How do the dividends compare? 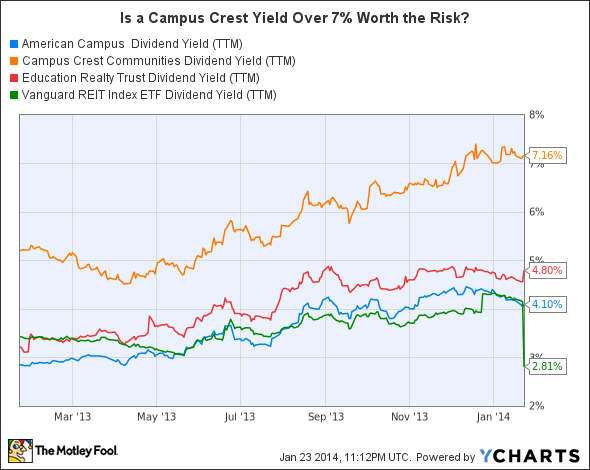 Clearly, Campus Crest is above the rest when it comes to dividend yield. Management appears to be focused on maintaining a healthy balance sheet as well. On Jan. 13, 2014, the company announced the sale of four student housing projects at an estimated 7.6% cap rate for $50 million. These funds will be used to reduce debt and invest in higher yielding opportunities, according to CEO Ted Rollins. He is also quite bullish on the opportunities that smaller colleges represent moving forward. In the future, Massive Open Online Courses, or MOOCs, may become a drag on student housing demand. Additionally, in the U.S., there appear to be some choppy demographic trends that for-profit student housing REITs must navigate. However, these companies appear to be very sophisticated and understand both the environment and the risks. There may be value in this beaten-down group, and a Campus Crest dividend yield north of 7% seems quite attractive.